"It's a miracle that neither the driver (who had been rear-ended by a drunk driver) nor the small child was injured in this freakish accident on July 8th. The driver of this car was involved in an accident at a nearby intersection. 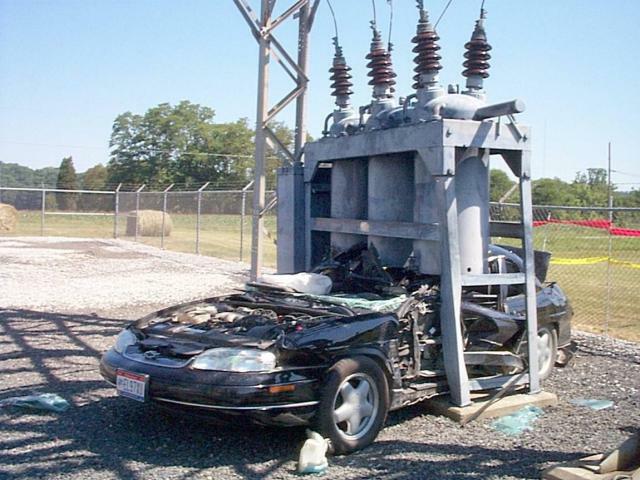 For some reason, the driver was unable to control the speed of the car, crossed the substation property, went airborne just before reaching the fence line, and ended up wedged underneath the 23KV #79 Line OCB. Blooming Ada, bullseye! The driver must have ducked at the last second. Is that a white cat by the front tire? That is not a cat. That is the car drivers clean underwear (bloomers or nickers) which fell out of the jockey box (glove compartment) when the air bag deployed. Mom to son, "Did you have clean underwear?" "Yes mom. They were right there by the front tire." "He's going to be just fine Mrs Cutout, a couple bruises and lacerations is all. But we had to cut off his underwear- it was absolutely disgusting!" It is indeed a miracle no one was seriously hurt!! It looks like the two tanks on the left were breached. DAAAAYYYUUUMMM!!! Someone's seriouly has someone watching over them!!! One of those rare occasions... I'm lost for words! Yeah, I got the "always wear clean underwear in case you're in an accident" speech from my mom, too. I doubt that the driver of this car had on clean underwear no matter how they were that morning. Whoa! They MUST have someone watching over them!